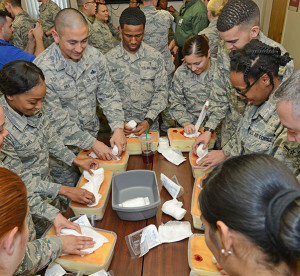 Airmen from the 412the Medical Group practice applying and stuffing gauze into mock wounds to stop bleeding on a patient or wounded person Jan. 29. Staff members from Antelope Valley Hospital in Lancaster, California, were invited to conduct a Stop the Bleed, Save a Life class for members of the 412th MDG. 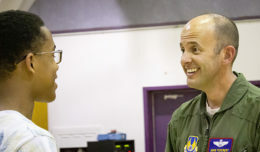 Airmen and civilians from the 412th Medical Group at Edwards Air Force Base, Calif., learned that with a few pieces of cloth and some bravery, they can save lives. The medical group invited staff members from Antelope Valley Hospital in Lancaster to conduct Stop the Bleed, Save a Life training Jan. 29, 2018. 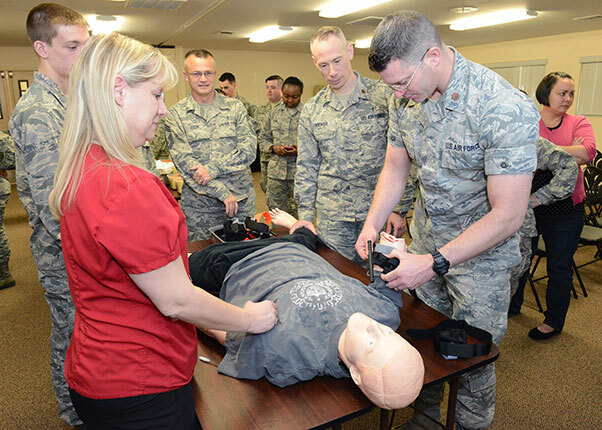 Mostly non-clinical 412th MDG staff learned how to take action and stop a victim’s bleeding by listening during a short class and then practicing how to apply tourniquets and gauze to dummies and mock wounds. Simple techniques such as applying pressure, stuffing clean cloths into wounds and applying tourniquets could mean the difference between life and death according to the instructors. Motivated by the 2012 Sandy Hook school shooting in Connecticut and multiple tragedies that occurred in the ensuing years, the American College of Surgeons convened the Hartford Consensus to bring together leaders from law enforcement, the federal government and the medical community to improve survivability from manmade or natural mass casualty events. Stop the Bleed, Save a Life came about to educate the public about the importance of bleeding control. Jeremiah Johns, an Antelope Valley Hospital trauma nurse and certified Stop the Bleed instructor, said that a trauma surgeon who treated the young victims of Sandy Hook believed that with some basic and simple on-scene treatment to stop blood loss, lives could have been saved. He also discussed how tourniquets applied to the limbs of U.S. war fighters in Iraq and Afghanistan saved many lives. Maj. Joshua Wilson, 412th Medical Operations Squadron (right), applies a commercially bought tourniquet to a dummy during a special training event Jan. 29 at the 412th Medical Group Education and Training building. The American College of Surgeons states that civilians need basic training in bleeding control principles to provide immediate, frontline aid until first responders are able to take over care of an injured person. 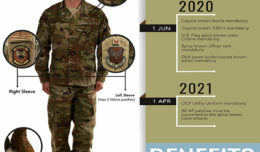 It may take some time for emergency personnel to arrive so without civilian intervention in these circumstances, preventable deaths will occur, according to the college.